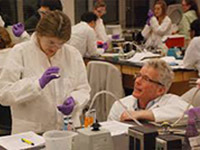 Our faculty and staff are leading or are involved with diverse and compelling basic and clinical research projects, some of which are highlighted below. We receive numerous awards and grants to support our research endeavors - our division obtained over $14.5 million in federal, industry, and foundation funding in 2017. The purpose of this study is to compare the efficacy of fidaxomicin and oral vancomycin for the treatment of clostridium difficile infection (CDI) in hospitalized patients receiving concomitant antibiotics for the treatment of concurrent systemic infections. The purpose of this study is to assess the efficacy and safety of maribavir treatment compared to investigator-assigned treatment in transplant recipients with cytomegalovirus (CMV) Infections that are refractory or resistant to treatment with ganciclovir, valganciclovir, foscarnet, or cidofovir. The primary objective of this study is to assess the clinical and antiviral efficacy and safety of nitazoxanide for the treatment of norovirus in hematopoietic stem cell and solid organ transplant recipients. The primary objective of this study is to evaluate the efficacy of letermovir (LET) versus valganciclovir (VGCV) in preventing CMV disease in adult kidney transplant recipients. “The biggest and sentinel event for the division [in the 1970s] centered on the discovery of Clostridium difficile colitis" - Joseph Silva, Jr., MD, division member 1972-1982. Robert Fekety, MD, the first chief of the Division of Infectious Diseases, and his research group was one of the first teams to report on a filterable toxin of C. diff as causing pseudomembranous colitis. Fekety’s group was one of the key early studies in identifying C. diff as the cause of antibiotic-associated pseudomembranous colitis. He and others did this by showing that a filterable substance, a toxin produced from Clostridia difficile, could cause pseudomembranous colitis in a hamster. He then made correlations in observations of humans. Today, C. diff remains a major problem in medicine, as it is occurring more frequently than in the past and is resulting in more severe disease, as well as being refractory to standard therapy with an unacceptably high relapse rate. 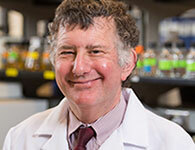 Our researchers are studying not just the single organism that causes disease, but also what changes occur in the entire intestinal microbiome that correspond to active C. diff infection. Other investigators are studying biomarkers as predictors of the severity of C. diff that will be useful in guiding management of disease. For decades, Hospital Epidemiology focused exclusively on the prevention and control of infectious diseases only within the hospital setting. Only in the 1980’s, when major outbreaks of infection in hospitals were traced to nursing homes and the community, did Hospital Epidemiology become Healthcare Epidemiology. 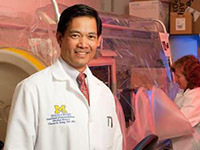 The Ann Arbor Veterans Affairs Infectious Diseases Section Faculty (Drs. Carol Kauffman, Suzanne Bradley, and Dennis Schaberg) and many Fellows (Drs. Nancy McGuire, Alfred Bacon, Carol Chenoweth, Joan Duggan, Preeti Malani, Shelly McNeil, Hector Bonilla, Sara Hedderwick, and Anurag Malani) were at the forefront of defining how older adults responded to infection and how the clinical aspects of various infections differed with aging. They were one of the first groups to study the risk factors for colonization and infection with antibiotic-resistant microorganisms and the transmission of these organisms, including methicillin-resistant Staphylococcus aureus, high-level gentamicin-resistant and vancomycin-resistant enterococci, and fungi within the nursing home setting. The results of these studies often challenged those assumptions previously derived from the hospital experience about optimal infection control procedures in these resource-limited settings and helped drive change in infection control policy and practice in nursing homes at national and international levels. Michigan was an epicenter of spinal meningitis complicating spinal injections of a steroid preparation that was contaminated during the compounding process by the manufacturer. Carol Kauffman, MD, assumed a national leadership position in providing guidelines and recommendations on diagnosis and the optimal combined medical and surgical treatment of these infections.